More than two-thirds of the prosecutors in the Queens District Attorney’s Office are white, non-Latinx — a far cry from the rich diversity of Queens, where no single racial or ethnic group makes up more than 28 percent of the population. The DA’s office attributes the racial and ethnic gap to disparities in the legal profession in general, and local law schools in particular. Student bodies are indeed disproportionately white at almost every law school in the area, according to enrollment data. People of color who have worked as prosecutors in the Queens DA’s office say the issue runs deeper than that, however. The office can do more to appeal to and retain people of color, starting with paving avenues for advancement, they say. Roughly 30 percent of the 343 assistant district attorneys employed on Sept. 6, 2018 were Latinx, black/African-American or Asian, according to the Queens DA’s office employment records. In Queens overall, roughly 75 percent of all residents are Latinx, black/African-American or Asian, according to the U.S. Census Bureau’s American Community Survey for 2018. The Queens DA’s Office is actually more diverse than most local prosecutors’ offices, other than Brooklyn and the Bronx, which both feature a slightly higher percentage of people of color as ADAs. “It should be noted that our last class of new assistant district attorneys included 36 percent people of color and/or women,” the spokesperson continued. The office’s employment report shows that 39 of its assistant district attorneys (11.4 percent) were African-American; 31 assistants (9 percent) were Hispanic or Latinx; and 34 of the assistants (9.9 percent) were Asian. The DA’s office said it specifically recruits from Albany Law, Brooklyn Law, SUNY Buffalo, Cardozo, Columbia, Cornell, CUNY Law, Fordham Law, Hofstra Law, New York Law School, New York University School of Law, Pace Law, St. John’s Law, Syracuse Law and Touro Law. Of those law schools, only CUNY Law enrolls a higher percentage of African-Americans (11.6 percent) than the Queens DA’s office employs, according to information compiled by the American Bar Association and available on each school’s website. CUNY Law also enrolls a far higher percentage of Hispanic/Latinx students (23.3 percent) than the DA’s Office employs. New York Law (16.6 percent), Hofstra Law (13.6 percent), Cornell Law (11.6 percent), Fordham Law (11.4 percent), Brooklyn Law (11.1 percent), Columbia Law (9.5 percent), NYU Law (9.5 percent) and Syracuse Law (9.4 percent) each have higher percentages of Hispanic/Latinx students enrolled than the Queens DA’s Office employs. Only Columbia (12.4 percent) and Cornell (12.6 percent) have higher percentages of Asian students than the 9.9 percent of Asians employed as Queens ADAs. Pace Law’s student body is 9.9 percent Asian. Those statistics pale in comparison to the demographics of New York City overall, and Queens specifically. The American Community Survey estimates that 20.5 percent of Queens residents are black or African-American; 28 percent are Hispanic or Latinx; 27.1 percent are Asian; and 25 percent of Queens residents are white, non-Hispanic or non-Latinx. Attorney Bright Limm, a graduate of CUNY Law, said it is true that the percentages of people of color enrolled in law schools are low. But, he added, the DA’s Office has a unique role in diversifying the profession, especially in a place as diverse as Queens. The Queens DA’s office has to do more to recruit and retain attorneys of color, said four people of color who have worked as ADAs in the Queens. Each person also told the Eagle that the office has to do more to diversify leadership. White men hold nine of the office’s top 12 positions (DA, chief assistant DA, executive ADA and deputy executive ADAs), according to a staff report provided by the DA’s Office. White men account for 11 of the bureau chiefs as well. There are also three white women, three African-American women and two Hispanic women serving as bureau chiefs, according to the DA’s Office. Mina Malik, a candidate for Queens DA, served as a prosecutor in the office for more than a decade before moving to the Brooklyn DA’s office and later the Washington D.C. attorney general’s office. Like each of the seven candidates for Queens DA, she has criticized the lack of diversity among office leadership. “During my fifteen years as an assistant district attorney in Queens, I saw firsthand how a failure to represent our diverse communities at the top resulted in harsh, outdated policies for those at the bottom,” Malik said in a statement in response to a previous Eagle report on office diversity. Black and African-American men are particularly underrepresented in the DA’s office. There were just 10 as of Sept. 6, 2018. Defense Attorney Victoria Brown Douglas has worked in the Manhattan DA’s Office and as a law school professor. She said black male candidates are available, the office just has to appeal to them. This article is Part Two in a series about demographics in the Queens District Attorney’s Office and the legal profession. Correction: A caption in this article originally referred to John Ryan as Acting District Attorney. John Ryan is Chief Assistant District Attorney in the Queens District Attorney’s Office. 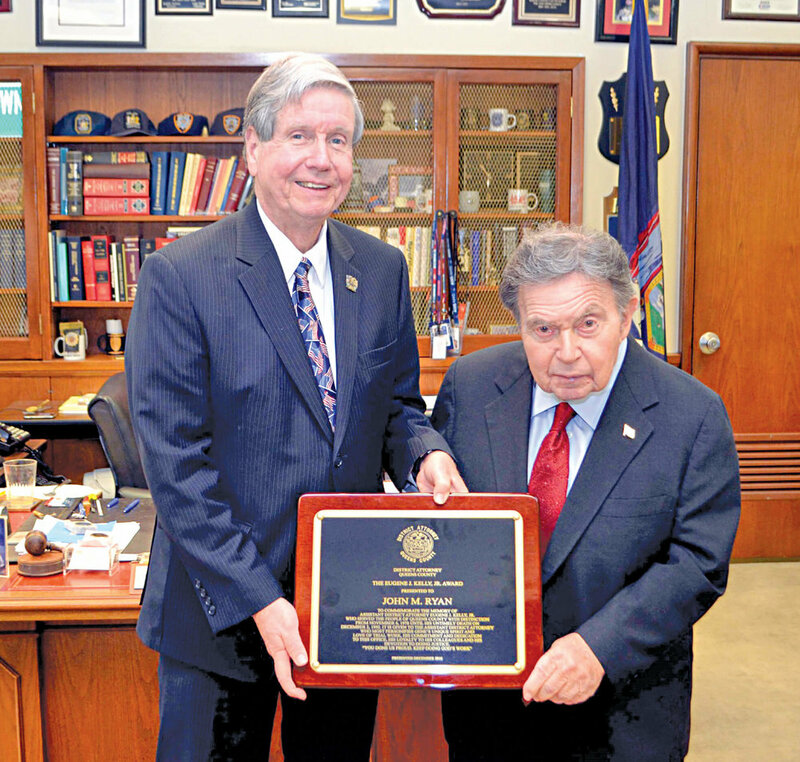 Richard Brown continues to serve as Queens DA until he officially resigns on June 1.